August 15, 2018 at 12:05a.m. *Winning restaurants are listed by location at the time of winning the award. Anniversaries are special. People celebrate work anniversaries, high school and college graduations, and some people just celebrate tomorrow. Well, the BurgerGuyz did a little celebrating of our own. We celebrated the anniversary of our first burger/restaurant review. Nine years, in fact. The date was July 22, 2009. Because we were fledgling burger reviewers at the time, we wanted to play it safe and start off with an established restaurant (or national chain, which was the first and last) and went to BW3s. As you can imagine, our first venture did not go so well. We told the manager who we were and what we were doing – and his response was ”Here have some fantasy football information.” We thought he would tell us about the burgers and the restaurant, but he passed us by numerous times throughout the night, probably thinking we were five crazy guys who wanted to re-live their crazy youthful pasts. The idea of reviewing Youngstown area burgers started formulating when JT and Scott stopped by Bill’s Place in Austintown and talked about reviewing burgers like a group in New York had been doing. They knew we had just as good as, and in our opinion, better, burgers than New York. That’s where it all started, and a little over 100 burgers later – we’ve been camping out on The Vindicator’s Wednesday food section and on vindy.com. We even received some Congressional help in our name. We started out as the Mahoning Valley Burger Review Board, and Congressman Tim Ryan joined us for a review and suggested we call ourselves the BurgerGuyz. 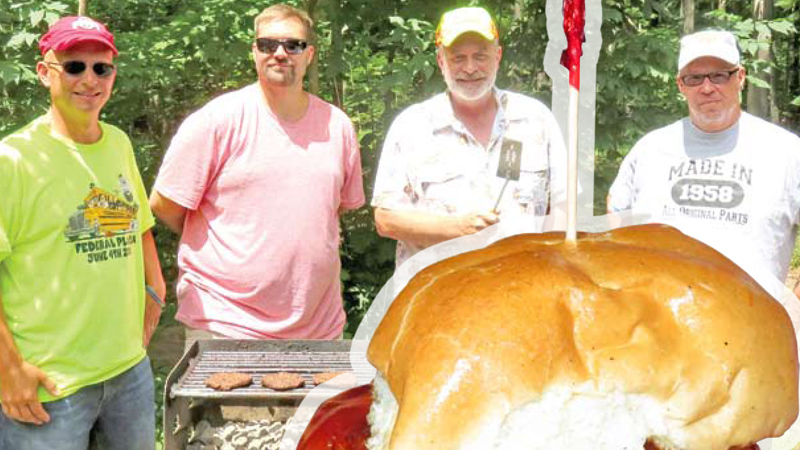 We were asked to judge the National Hamburger Festival in Akron for three years. We hosted our own Hamburger festival, and Fat N’ Furious Car show in Warren and Youngstown in 2015 and 2016, donating monies to Second Harvest Food Bank and the Rich Center for Autism. We’ve had numerous national and local celebrities join us for our monthly burger reviews, most notably former lightweight boxing champion Ray “Boom Boom” Mancini, all four members of Discovery Chanel’s Fat n’ Furious cast, and CD93’s very own Fast Freddie Woak. We have been doing our Meat 16 cheeseburger challenge for three years now, and it is continuing to steamroll and grow bigger and bigger each year. Besides raising money for charity, my favorite review was sitting beside “Boom Boom” Mancini, eating a burger and listening to his boxing stories. I could listen to him tell his boxing tales, and he makes it sound like it was just yesterday he was in the ring. One of my favorite burgers is the High Pointe Burger (Niles). It’s two patties with hot peppers and chainsmoker sauce. Every time I go there, I say I’m going to try something different, but I always end up with the High Pointe Burger and leave extremely satisfied. Another place that stood out for me was Big D’s Newton Grill. It’s not just one burger there, but everything he transforms into a burger tastes great. And it seems any ingredient he has he can use to make a delicious burger. There’s not really a bad burger in the bunch we’ve reviewed so far. Reflecting on the the last nine years, Scott said, “I was thinking today about the best burgers that we had over the years, and two places stand out for me, and they both won burger of the year. The first one is the Lake Tavern. I remember it was a cold winter night as we did our review. First off, it was probably the farthest north we have gone for a burger, and I wasn’t expecting much. Then the burger was delivered in a basket – still not real impressive. Then we picked up the burger and took a bite so full of flavor, with fresh toppings and a nice juicy burger. I definitely didn’t see that coming. The second place that left an impression was Sunrise Inn. Going in, I’m thinking Italian place with good pizza, but didn’t expect much from the burger. This was the first place where we got the 1/3 of a pound burger and a bun that actually held up to that amount of meat. Another burger loaded with flavor! I guess the common thread of these two burgers is that we really came in with pretty low expectations, and we were really surprised! This has been and will continue to be a 5-star adventure. We look forward to as many adventures as the eating public will help us embark on. January 2, 2019 12:05 a.m.
January 1, 2019 5:25 p.m.